The village of Pejarakan, district Gerokgak, Bulelelng, is located next to the Bali Barat National park. The population consists mostly of subsistence farmers with limited land holdings: on average 1000-3000 m2. The main source of income is from raising livestock. During the dry season the land goes largely uncultivated due to limited water supply. There is a short monsoon season lasting 3 -4 months and then a long drought period – sometimes up to 7 months without rain. Temperatures during this have been recorded as high as 114 deg F. During the dry season some of the farmers have access to water taken from mountain springs 8-10 kilometers away and can grow vegetables year round, peppers, eggplant, beans and green vegetables. 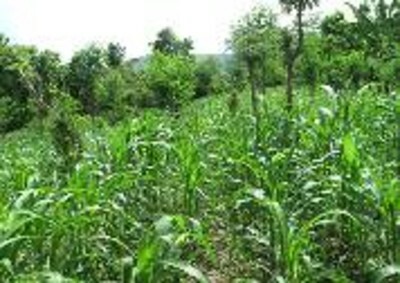 During the monsoon season most of the land is planted with corn, peanut, chili and fodder grasses. In the dry season there is often insufficient fodder to feed the livestock and there is subsequent encroachment on the National Forest lands. Fattening of cows and pigs is the main way for farmers in the area to earn cash. 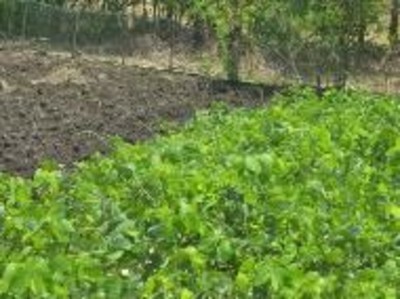 The manure is used as fertilizer for the agricultural land. In 2012 Biosphere Foundation in conjunction with various local community organization and LIPI (Indonesian Institute of Science) started to carry out relevant research activities. 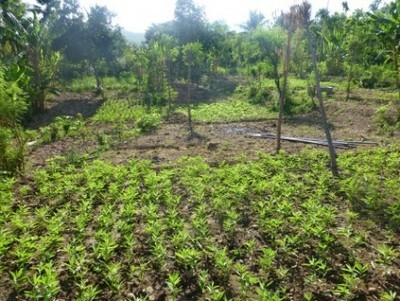 These activities included research into agricultural improvement in the farms surrounding the National Park that would utilize sustainable methods to increase crop production using an agroforestry approach. The study aimed to optimize agricultural production both in the monsoon season and the dry season to improve the economic condition of farmers and increase food and fodder production. All parts of the research were carried out using a system of participatory research with the farmers themselves taking part in the set up and collection of data. All crops were tested without any use of pesticides and with locally obtained cow manure as fertilizer. In November of 2014 an experiment was set up to block test the use of the green crops velvet bean Mucuna pruriens and sun hemp Crotalaria juncea. Nine plots each 37.5 m2 were set up. Three were planted with sun hemp three with velvet bean and three were left as control plots. The sun hemp and velvet bean were cut at the roots at about 6 weeks just before flowering and the plant material was returned to the soil. The entire area was subsequently planted with a local corn variety. The corn crop was harvested and evaluated in 2015. The most successful green crop was the velvet bean, which increased the corn crop production by 25%. 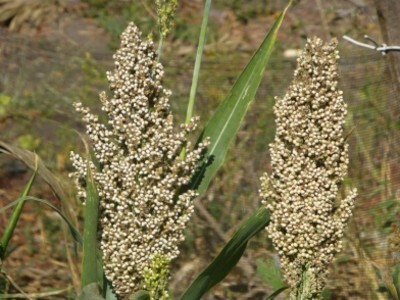 The Sun hemp also produced a small increase in production, however this plant was difficult to incorporate back into the soil and the farmer reported that it was too much work to be worthwhile. Green cropping with a high nitrogen fixer like velvet bean can help to reduce the dependency on cow manure or chemical fertilizers and improve soil structure. As an intercrop it can also suppress weeds. 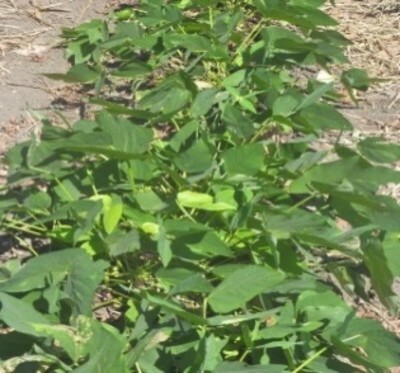 Since this experiment two other farmers have started to use velvet bean as a green crop and one farmer is currently growing a crop for us to provide more seed. The main problem we encountered is that farmers are unwilling to devote the 6 weeks necessary to grow the green crop before planting their corn. Traditionally the corn is planted here, as soon as there has been at least three heavy rains. With this in mind we tried intercropping with the bush variety of velvet bean but found the plant did not thrive well here. We also found that they produced very little seed which would make it hard to produce enough quantity for future plantings. 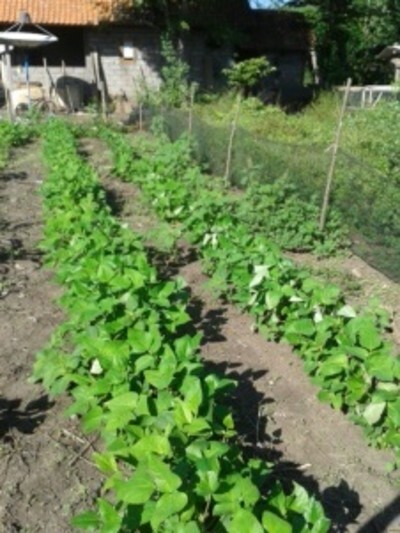 However, we are now experimenting with intercropping the vining variety of velvet bean and then cutting it at six weeks and mulching with green material. 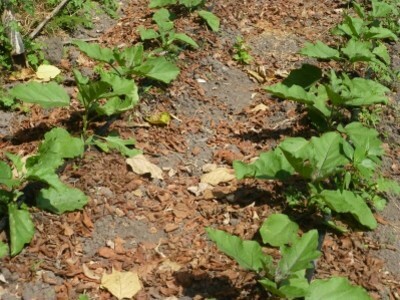 This eggplant did really well here and seems to be very drought and disease resistant, although some watering is necessary in the dry season which we provided with drip irrigation. The fruit were regraded favorable for eating and marketing. They were planted in rows 30 cm apart with the rows being 1 meter apart. We do not have very accurate harvesting data but farmers who tried it estimated about 8 to 10 fruits per plant over its life time (about 6 months). Our main problem with this crop was obtaining viable seed for future plantings – germination rates were very low. We first tested this crop on a small patch at our field station to see if it was drought resistant and then started a larger area with one of our participating farmers. It was planted at 60 cm apart in rows one meter apart at the end of the wet season using drip irrigation. An area of approx. 20 sq meters gave 1.2 kilo of dried flowers. We kept one row for seed and an area of 10 sq meters gave 500 gms of seed. 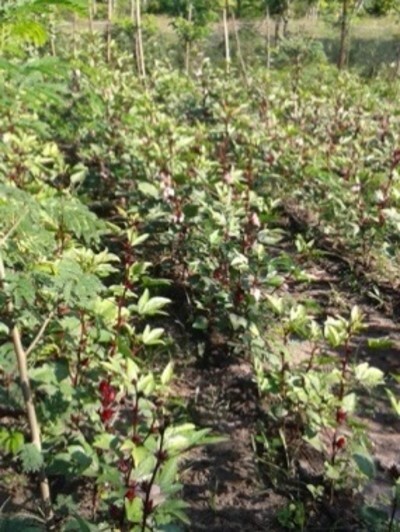 This plant is not well known here and the farmers were not much interested in drinking the tea. However, it could be developed as a cash crop. Planted at 30 cm spacing in rows 1 meter apart. Seeds were planted with irrigation in May and produced well until August - however could not continue in the heat of the late dry season. This plant is a good potential intercrop and produces a large tasty bean. Full harvest data is not available however the farmer reported that it compared well to other dry bean crops. We did some small trials of both these varieties, in rows 1 meter apart with plants 15 cm apart using drip irrigation. They were planted in late June after the rains to test for heat and drought hardiness. Both types did well producing healthy plants and seed. The seed crop was damaged by mice before we were able to harvest it, but the farmer reported that production compared well with local bush bean varieties. Planted at 60 cm spacing in rows 1 meter apart. Winged bean is already known in the area but not widely used. This variety grew vigorously and are harvested continuously well into the dry season. Production data is not available but this would seem to be an excellent crop for supplementing living fences. Planted at 30 cm spacing in rows 1 meter apart. Tested in dry season for drought hardiness and grain production. This crop was planted with supplemental irrigation in April and harvested at the end of July. The production of clean seed was 9.2 kilo per are. The spacing for this planting in our first test was very large (30cm spacing in rows 1 meter apart), and it is predicted that with smaller spacing the crop could be increased to approximately 36kg per are. The seeds are large and white and make good flour for cooking. The farmers were very interested in developing this crop further. This was one of our best producing Sorghums. Early experiments using drip irrigation with rows 1 meter apart and plants 30 cm apart gave yields of approx. 10 kilo per are. However, a recent experiment with 3rd generation seed planted in rows 50 cm apart gave a yield of 50 kilos per are. The variety seems to be very drought tolerant and disease resistant. We tested this crop with drip irrigation in rows 1 meter apart. The crop took about 4 months to mature and the seed heads matured at different times. Although the plant was very drought resistant and completely disease free the yields were very low (about 1.6 kilo from 1 are). 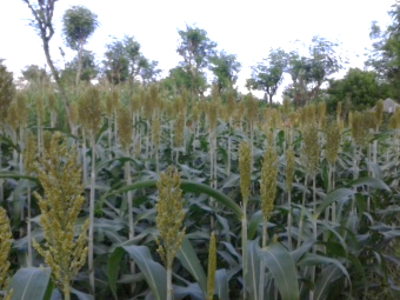 The crop could definitely be planted at much higher density but the farmers had little interest in developing this further as millet is considered "bird food" and there was not much interest in eating it. We tested the varieties Komohana and Tropic, but as with all other tomatoes tested here they failed to thrive. The plants start off well but as soon as they start to fruit they go yellow from the bottom up and die. It is suspected they that are infected with an insect borne virus and also it is probably just too hot here to grow tomatoes well. We tested UC-27 and Burma Round. Although the plants did grow the pods were very small and the plants died as soon as the temperatures got very high. We tested Red noodle and Kaohsiung, neither did well as they were very susceptible to insect damage. We obtained a cutting of Chaya from the ECHO Asia conference in Medan. They have thrived here and the plant is slowly becoming popular as a pot green - neighbors say they prefer it to Cassava leaf. 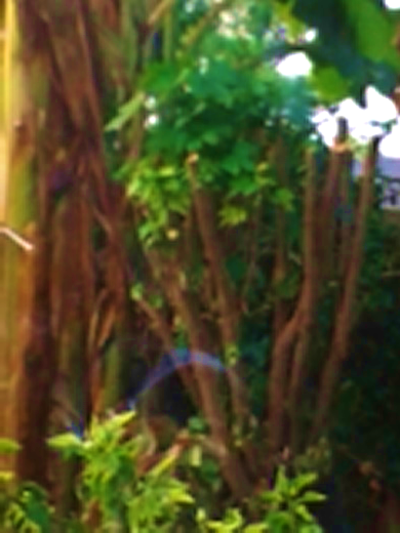 As you can see from the picture below of our largest tree we are getting increasing demand for cuttings!